An airline cannot refuse to serve you for having a disability, but it may not be able to provide you with the equipment you need to travel if you do not give them enough notice. Make arrangements with an airline representative at least 48 hours ahead of your departure time to ensure that you have the wheelchair, respirator, or other medical equipment you need for your flight. If you are unable to stand and walk through an airport security scanner, then you must be prepared for a pat-down at the airport. If you fear that the pat-down may feel invasive, remember that you have the right to ask for a private security screening. 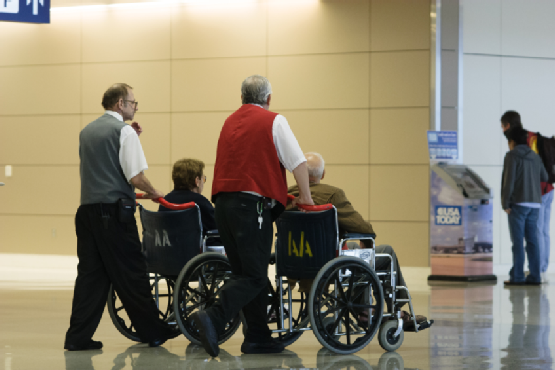 After you have boarded the plane, your wheelchair may be checked at the gate and flown underneath the plane with the passengers’ checked baggage. To avoid losing anything, remove your personal belongings from wheelchair pockets, as well as any cushions, pillows, or accessories you use to make your wheelchair more comfortable. Flying with a wheelchair is easy, but it is still helpful to be prepared. Make advanced arrangements for a wheelchair and any other equipment you require with an airline representative in advance, and scope out your ground transportation options. If you want to make the accommodations at your destination more accessible, you may also want to rent a wheelchair ramp. To speak with an accessibility equipment professional about your ramp rental options, call Williams Lift Company at (908) 322-7070.